I have long dreamed of having a home library. As a little girl, my sister and I would catalog our books and play library. Now that I'm grown and I love filling my home with wonderful literary resources, the desire for a home library has not diminished, rather it has increased. My old homeschool room was somewhat of a library. The problem was that all of the books didn't fit—that is if I still wanted people to fit in the room as well. 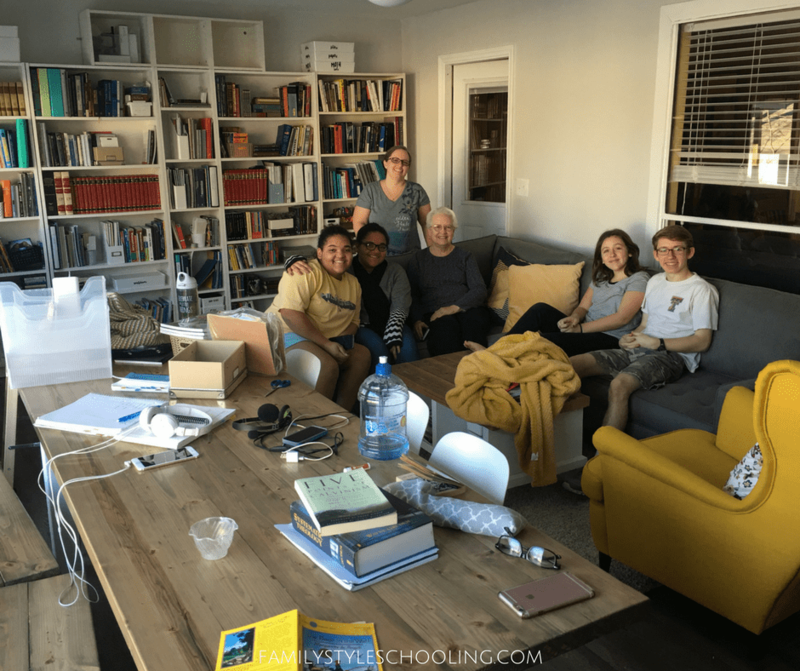 As my kids have grown older, I've realized that I need less of an official "school" room. This led to a dream I had where my daughter and I were sitting in the back patio that had been converted to a library. Brilliant! Why not reclaim some completely unused space and fulfill a dream at the same time? So we asked our handyman friend over to see what his thoughts were, and two months later, I'm sitting in my dream room writing this blog. I can't believe this space was here, and that it all turned out so beautifully. I never want to leave. To really appreciate the space, we have to go back to the beginning. I've grown up in this house (at least since I was six months old). When I was eight, my parents put a pool in the back yard. In the summers, we live outside. We had this great patio space which was sheltered by three walls of the house. The only problem—it gets super hot in there. Additionally, with this great shade structure, the posts took up most of the "living" space of the patio. The result? The patio was merely a pass through to the pool, and ended up being a glorified storage space for the pool gear. 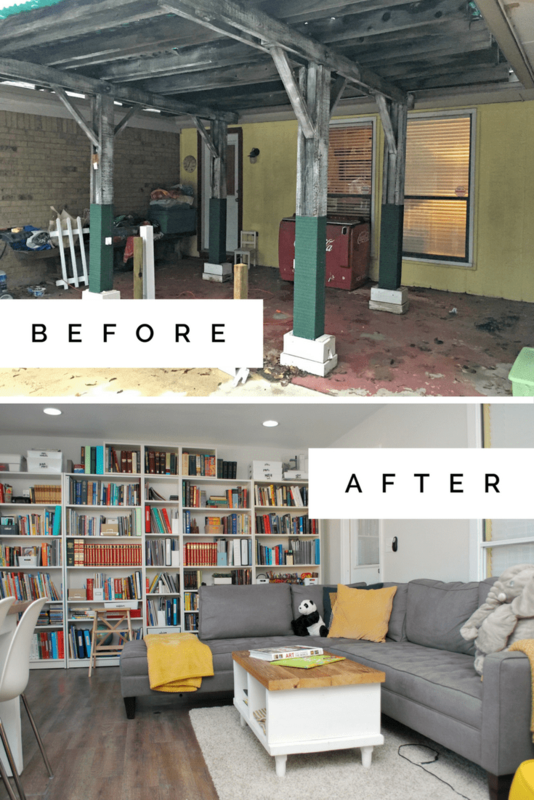 When we took down the pergola, we couldn't believe that the space was so big! This would make a glorious home library. Just knowing that the space was there was exciting. However, as excited as my husband was about the construction end of a project like this, my mind was really on how to design the interior of the space. It was a challenge to communicate my vision. Thankfully, I found this awesome free online home planner on IKEA's website that helped me really figure out what we needed. Since I already had many of the Billy series bookshelves, it made sense to use their planner. 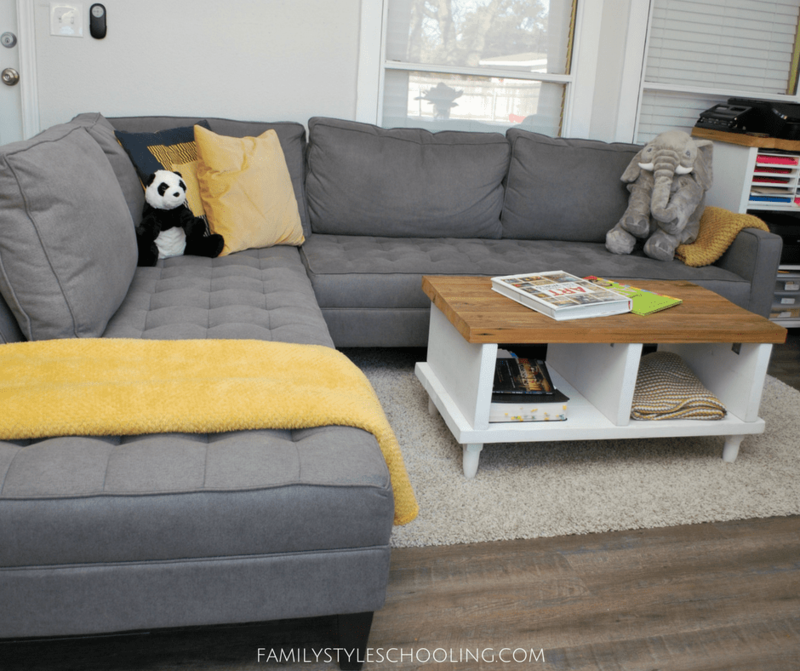 You can add many of the IKEA furniture pieces to your plan and see how they work in the space. Believe me...I rearranged this room like a thousand times. My husband was so thankful that I could do this virtually! It saved his muscles a lot of soreness. 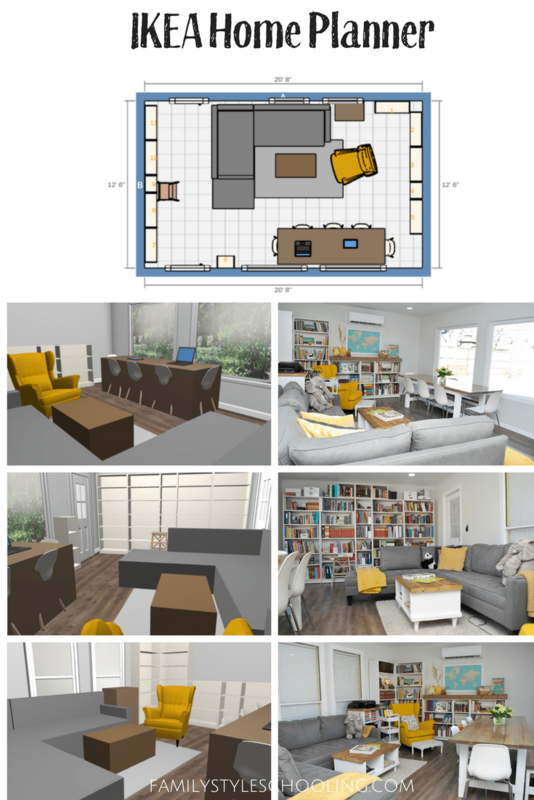 The cool thing is that once you have your furniture placed like you like it, you can rotate around in a 3D rendering of the space. I twirled around my design a million times. 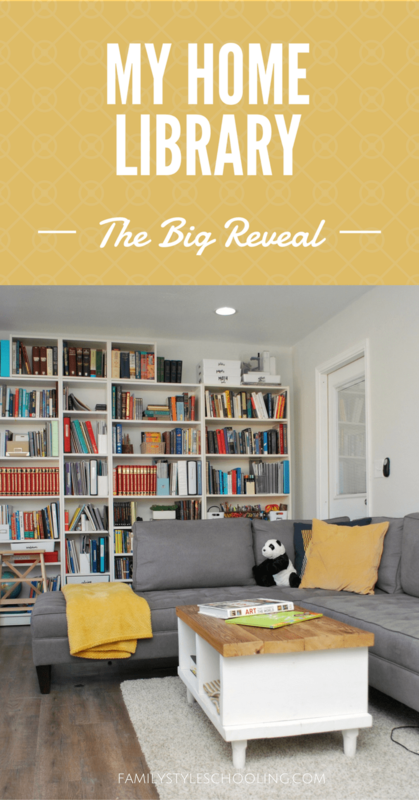 I used the IKEA Home Planner to rearrange my furniture and plan out what we needed to realize my vision! Eventually I found that any furniture pieces that were not at IKEA could be built virtually with "floor obstacles" to give me a better idea of the space. The beauty of my home library is that it is way more functional than a school room. 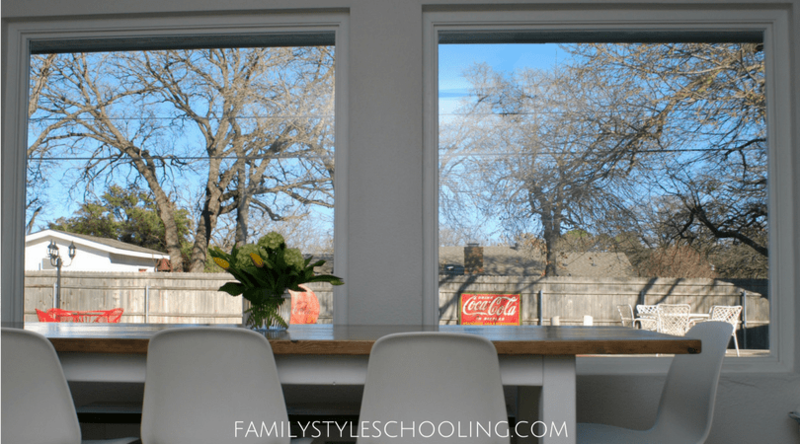 It serves as my home office (you'll see plenty of pictures from this room in the future), a mom hangout during my husband's music lessons, an extra guest room, and a perfect place to watch swimmers in the summer and keep cool. My goal with the color scheme was to keep the room light and clean. 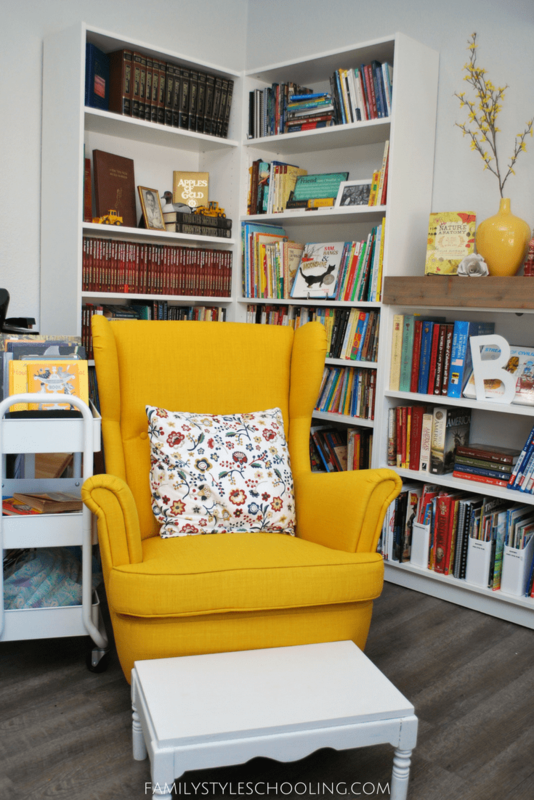 The books and a couple of pops of yellow really breathe life to the room. 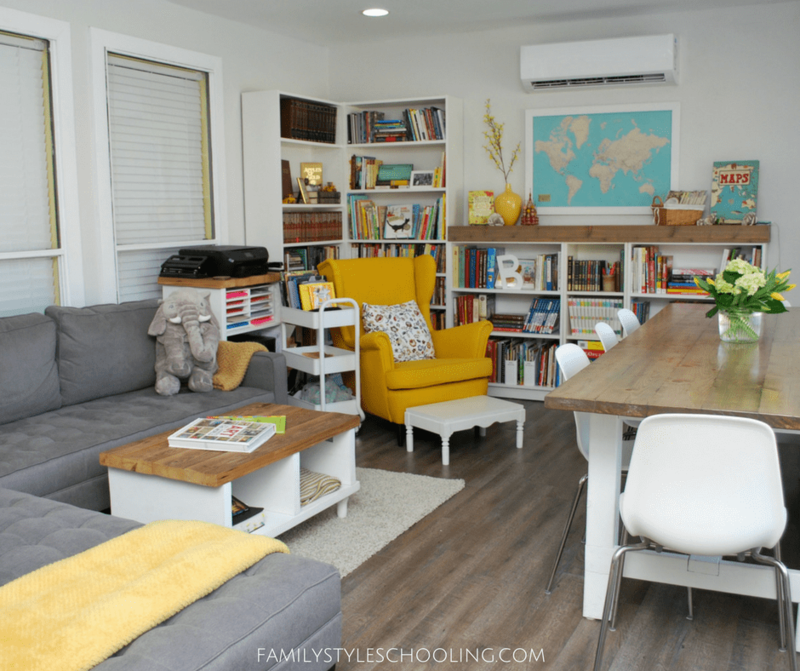 We installed a mini-split HVAC system which is a remarkably efficient air conditioning alternative, and it was much cheaper than connecting the new room into the existing duct work. (It's hanging above the map if you didn't notice). The best part for me is the view outside. This wall faces east, so we get some sun in the morning, but it isn't directly shining in for long. When the trees fill out with leaves soon, it will be even better. Then the room stays bright all day long. We've loved bird and squirrel watching from the couch. Even better, my husband and I enjoyed watching a thunder storm the other night. Since our neighbors are downhill from us, we have the luxury of leaving the windows untreated to let in the maximum view. My other favorite feature is my Push Pin Travel Map. It is a beautiful work of art in my home library. Although it looks pretty in the pictures, it most likely will be lived in right? And that's the best part to me. I want it filled with kids as well as books. And kids make messes. Oh Betsy, this is BEAUTIFUL and such a great use of space. Have to love having your home library and still can use the space for anything. Gorgeous, I know you’re proud of it and such a clever idea for upgrading the space. Thanks for the sharing!! I know it took a lot of hard work, patience and time but oh the memories you’ll make now. Beautiful! You and yours will enjoy this space for years to come. Congratulations on making your vision a reality! 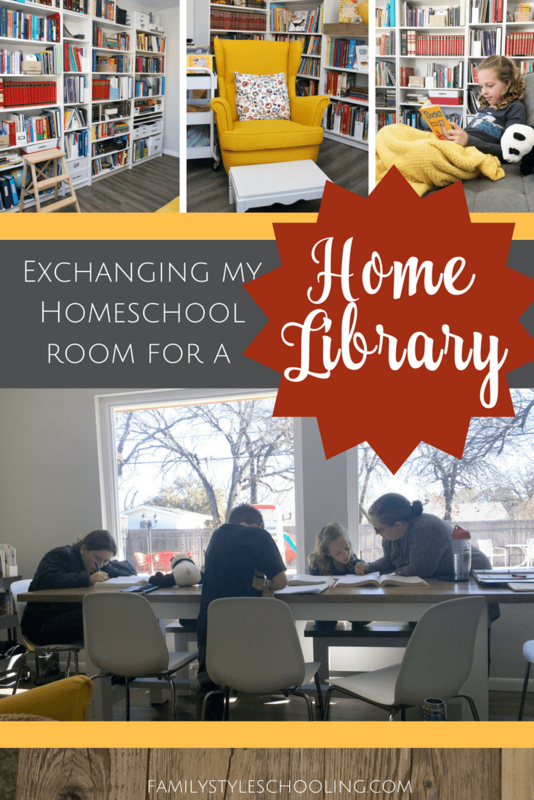 I have zero interest in having a “homeschool room”, but a home library — that I would love! What a beautiful space! LOVE LOVE LOVE!!!! 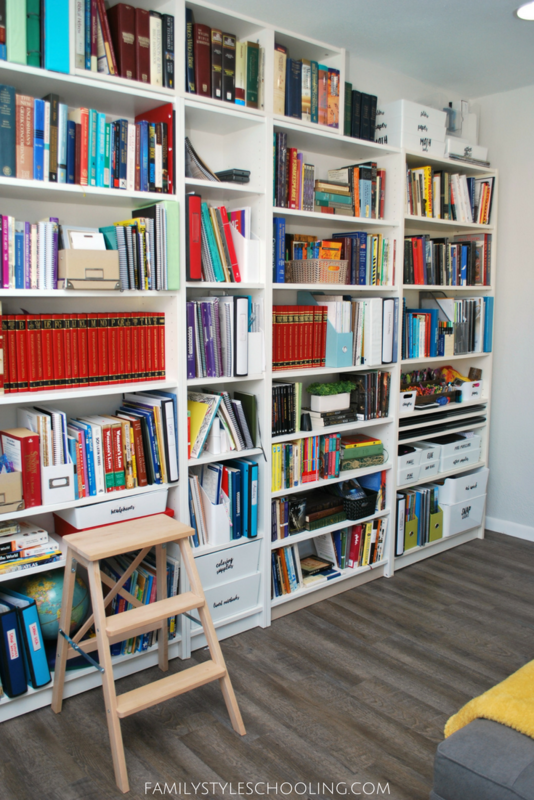 We have the same IKEA shelves in our basement schoolroom. I want to come over and read in your space – you did such a beautiful job! Thanks Mary! 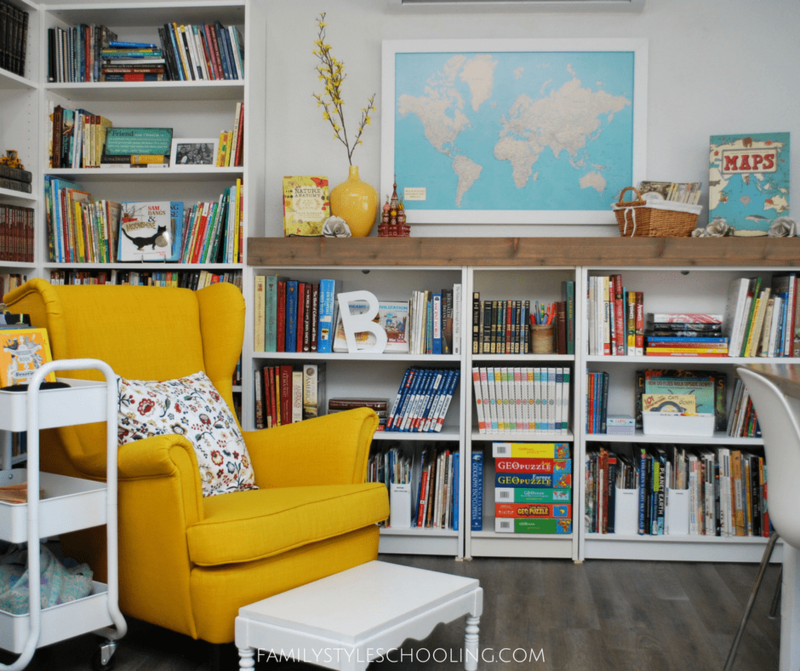 I love my white IKEA shelves and I remember seeing them in your schoolroom too! We must be kindred spirits.